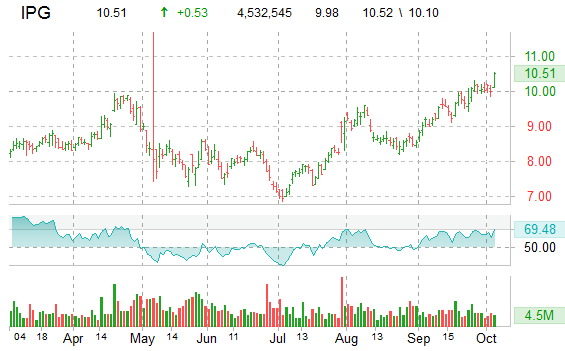 IPG – Interpublic Group Companies, Inc. – Long-term bullish trading in Interpublic Group LEAPs indicates one strategist is preparing for the price of the underlying stock to climb substantially higher by expiration day in January 2012. Shares of the advertising and marketing services firm rose 4.80% to $10.46 by 2:50 pm ET. The options strategist appears to have enacted a delta neutral transaction, buying 210,000 shares of the underlying stock at $10.40 each, spread against the sale of 5,000 calls at the January 2012 $12.5 strike for an average premium of $0.975 apiece on a 0.42 delta. The sale of the calls can be considered a financing mechanism as well as a potential exit strategy on the long position in shares. The investor could wind up having the shares called from him at $12.50 each in the event that at expiration IPG’s shares exceed $12.50. In this case, the trader would realize gains of 32.625% on the rally in shares from the reduced purchase price of $9.425 a share up to $12.50 a share. Interpublic’s overall reading of options implied volatility is down 3.4% at 40.65% one hour before the final bell. The marketing services provider announces its third-quarter results before the market opens on October 29, 2010. UPS – United Parcel Service, Inc. – A sizeable near-term bullish transaction involving 23,000 call options and a large chunk of UPS shares caught our eye today. Shares of the world’s largest package delivery company, which announced Friday it plans to raise the non-contractual UPS Freight rate by 5.9% starting October 18, are currently up 3.20% to stand at $68.25 as of 2:30 pm ET. It looks like the investor responsible for the transaction established a covered call on the stock to position for the price of the underlying shares to continue higher ahead of October expiration. The trader purchased approximately 322,000 shares at $67.57 each and sold 23,000 calls at a premium of $0.19 apiece on a 0.14 delta. The sale of the call options reduces the cost of getting long the stock. Additionally, the short stance in calls serves as an effective exit strategy for the trader should UPS shares soar above $70.00 ahead of October expiration. The investor is prepared to have shares called from him at $70.00 each, which would result in maximum potential profits of 3.89%. However, the trader may be taking a longer-term bullish stance on the stock, and hoping to see shares trade below $70.00 through expiration day. In this scenario, the calls expire worthless and the investor may choose to maintain the long position in UPS shares in order to ride along with whatever rally he expects to come his way in the future. 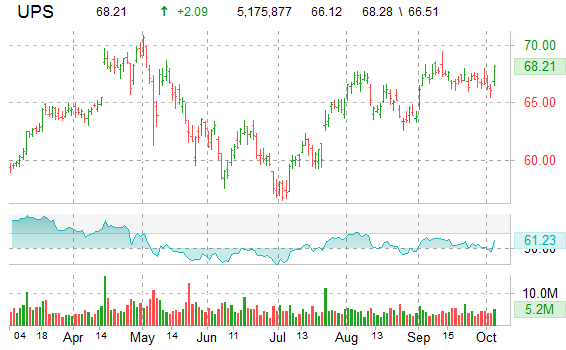 The current 52-week high on United Parcel Service is $70.89, attained back on May 3, 2010. ATML – Atmel Corp. – One long-term bullish options strategist took profits off the table today by rolling a previously established long call position on the manufacturer of semiconductor products up to a higher strike price in the February 2011 contract. 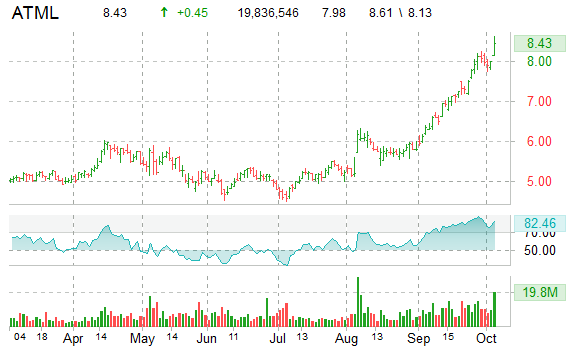 Atmel’s shares surged 7.90% during the session to secure an intraday- and new 52-week high of $8.61. It looks like the investor originally accumulated 10,000 long calls at the February 2011 $7.5 strike in the latter half of September for an average premium of $0.82 per contract when ATML shares were trading between $6.97 and $8.05. Today, the trader sold 10,000 now in-the-money calls at the Feb. $7.5 strike for an average premium of $1.375 apiece, booking average net profits of $0.555 per contract. The investor extended bullish sentiment on Atmel Corp. by scooping up 10,000 fresh calls at the higher February 2011 $9.0 strike at a premium of $0.70 each. Profits start to amass on the new bullish stance if the semiconductor maker’s shares rally 12.65% over today’s high of $8.61 to surpass the average breakeven price of $9.70 by expiration day in February. Atmel is scheduled to report third-quarter earnings after the final bell on November 4, 2010. 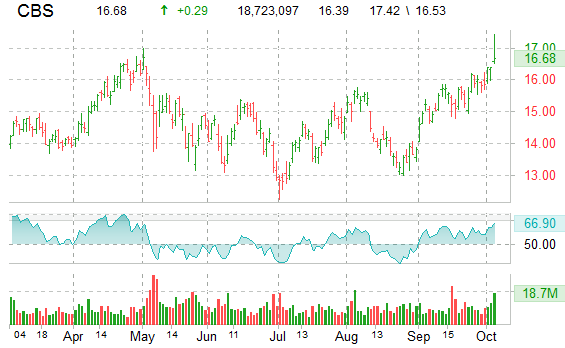 CBS – CBS Corp. – Shares of the owner of the most-watched U.S. broadcast network rallied as much as 6.30% in the first half of the trading session to secure an intraday- and new 52-week high of $17.42 after analysts at Nomura Holdings Inc. initiated a ‘buy’ rating on the stock with a target share price of $22.00. CBS Corp. shares are currently up 2.85% at $16.86 as of 1:30 pm ET. Bullish options investors were quick to position for continued appreciation in the price of the underlying shares today. One optimistic trader established a ratio call spread, buying 2,000 calls at the December $17 strike for a premium of $1.30 each, and selling 4,000 calls at the December $19 strike at a premium of $0.45 a-pop. The net cost of the transaction amounts to $0.40 per contract. Thus, the investor is poised to profit should shares in CBS increase 3.20% over the current price of $16.86 to surpass the effective breakeven point at $17.40 by expiration day in December. Maximum potential profits of $1.60 per contract are available to the trader if shares jump 12.70% to settle at $19.00 at expiration. The greater proportion of sold call options exposes the bullish player to losses in the event that shares blow straight through $19.00 in the next few months. Losses start to amass if shares surge 22.20% over the current price to exceed $20.60 ahead of expiration day. The overall reading of options implied volatility on CBS shrank 4.00% to 40.26% by 1:35 pm ET. CBS Corp. is slated to report third-quarter earnings after the final bell rings on November 4, 2010.